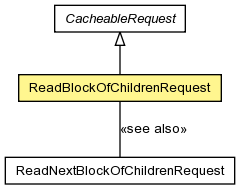 Instruction to read a block of the children of a node, where the block is dictated by the starting index and the maximum number of children to include in the block. This command is useful when paging through a large number of children. Create a request to read a block of the children of a node at the supplied location. Get the index past the last child that is to be included in the block. Get the starting index of the block, which is the index of the first child to include. Create a request to read a block of the children of a node at the supplied location. The block is defined by the starting index of the first child and the number of children to include. Note that this index is not the same-name-sibiling index, but rather is the index of the child as if the children were in an array. Get the starting index of the block, which is the index of the first child to include. This index corresponds to the index of all children in the list, not the same-name-sibiling index. Get the index past the last child that is to be included in the block. This index corresponds to the index of all children in the list, not the same-name-sibiling index. the index just past the last child included in the block; always positive and always greater than startingAtIndex().